Innovation is underutilized in the country's agriculture sector, agribusiness experts point out. 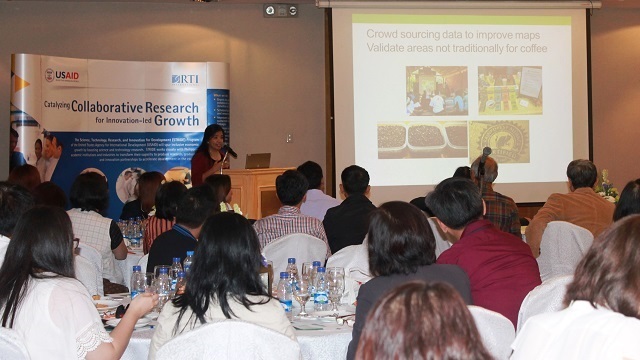 MANILA, Philippines – Inclusive growth in the Philippines must start with agriculture, the university researchers, policy makers, and social entrepreneurs present at the Philippine Government University Industry Research Roundtable (PGUIRR) meeting for agribusiness said on Thursday, January 21. Inclusive growth is one of the economic development strategies of the outgoing administration of President Benigno Aquino III. "The Philippines’ investment in research and development (R&D) is second to the lowest among Southeast Asian nations, at the same level as Vietnam and Myanmar," said Dr. William Dar, president of the InangLupa Movement, which advocates for the modernization of the Philippine agriculture sector. Dar cited the potential of technology business incubators (TBIs) of the Department of Science and Technology (DOST) as social enterprises that can empower small farmers in the provinces, transform farmers into entrepreneurs for them to move beyond crop production and harvest and into agribusiness. “But with a funding of P10 million ($209,095.40) for two years, I don’t know how far that funding will go,” says Dar. Innovations also remain underutilized by the agriculture sector, said Rey Ebora, executive director of the Philippine Council for Agriculture and Natural Resources Research and Development (DOST-PCAARD). “Technology transfer to the farmers remains a challenge,” he added. While PCAARD has strategic Science and Technology (S&T) plans per industry (for livestock, fisheries, coconut, among others), based on the gaps they have identified, the government agency said that sometimes they do not have the technology and the expertise to execute certain interventions. “Sometimes, we don't really have the expertise, so the government should really invest more in R&D. We need to implement projects that can complete the S&T chain, so that we can bring the technology to the users,” Ebora said. INTERVENTIONS. Executive director Rey Ebora of the DOST-PCAARD talked about filling the S&T gaps in the Philippine agriculture sector. Photo courtesy of RTI International. Thursday’s forum was organized for the Science, Technology, Research, and Innovation Development (STRIDE) program of the United States Agency for International Development (USAID). 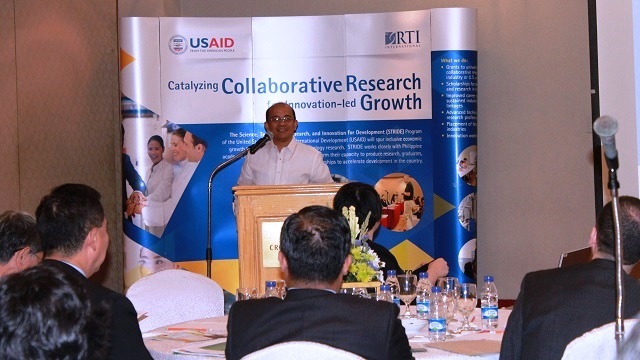 STRIDE is a 5-year initiative of the USAID that aims to boost inclusive economic growth in the Philippines through science and technology research. The project aims to create a network of researchers, investors, and entrepreneurs who continuously innovate and turn discoveries into products and enterprises. By working closely with the Philippine academic institutions and industries for research and innovation partnerships, it hopes to accelerate economic development in the country. 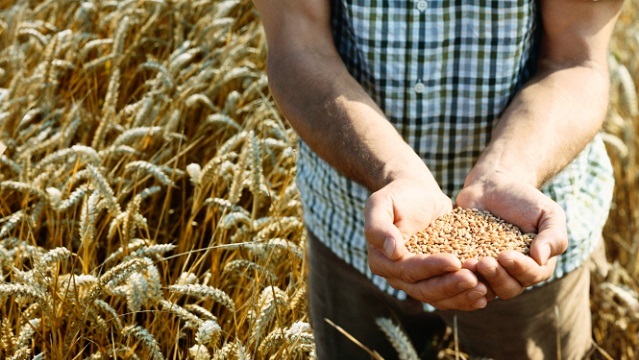 STRIDE is targeting research and development in the agribusiness, fisheries, and food manufacturing sectors, areas which, as researchers and advocates agree, need all the investment and assistance it can get. But beyond these government agencies, Dar said that social enterprises in agribusiness, even those in the TBIs of the DOST, can help bridge the gap between technology and the farmers..
"Inclusive growth in the Philippines must start with agriculture—we need to maximize land productivity, even in the small lands owned by small farmers,” Helen Vallejos, social programs director of social enterprise AGREA Philippines, which aims to empower small farmers and fishermen through education, community development, leadership, and innovation programs. Noting that Philippine farmers are getting older, Dar said that investing more in agribusiness will also entice more young people to take up farming again through social enterprises. AGREA, for one, is a social enterprise made up of millennials who are into agriculture and land management. “We have hubs for startups, like Impact Hub, A Space, among others, yet there are no agriculture hubs for social enterprises that are into agribusiness. We need to change that in order to attract more millennials to take up farming,” notes Vallejos. FILIPINO ESPRESSO? Professor Ma. Carmen Lagman of the De La Salle University discussed future innovations for the local coffee industry. Photo courtesy of RTI International. The forum also showcased how partnerships between government agencies, the academe, and agribusinesses can pave the way for developments in agriculture research. USAID STRIDE grantees took the floor to explain their agriculture research projects being undertaken in the provinces, in partnership with different agribusinesses. Ma. Carmen Lagman, a USAID STRIDE grantee who is also an associate professor at the De La Salle University, discussed innovations her team is making for the “Pinoy (Filipino) espresso,” that is, for our local coffee industry. “We’re crowdsourcing data about soil to improve maps and validate areas that are not traditionally for coffee. We’re also developing a low-end technology for coffee variety identification, and making these data public,” Lagman said. The group of Agapita Salces, a grantee who is also an assistant professor at the University of the Philippines- Los Baños College of Agriculture, is working on developing sustainable dairy cattle genetic stock in the Philippines, with the objective to establish a base for future cattle breeding. “Genetic improvement is permanent and cumulative through time, thus there is no need to import expensive foreign breeds,” Salces said. On the other hand, the group of Raffy Espiritu, a grantee who is also an agricultural engineering professor at the Don Mariano Marcos Memorial State University, is working on the “UBE-Tech Project, which aims to improve the processing technology and map the potential expansion areas for the ube (purple yam) industry in the Northern Philippines. The USAID STRIDE program is still on the look-out for research grantees, especially in the agribusiness, fisheries, and food manufacturing sectors. Applications are still open until April 15, 2016. To apply and know more about the program, you may access the online application forms available at http://www.stride.org.ph/. Is it possible to create 75 million entrepreneurs worldwide?